Our return journey through upstate New York took us into Ohio on I-90 rather than I-80 hence we elected to make a last minute decision and visit one more framer on the Northeast side of Cleveland. We dropped in on the Framing Goddess, Edith Antl of Art, Etc. located on Murray Hill Road in Cleveland’s Little Italy. Edie has owned this business for 28 years in one previous location before moving into this quiet and artsy neighborhood. 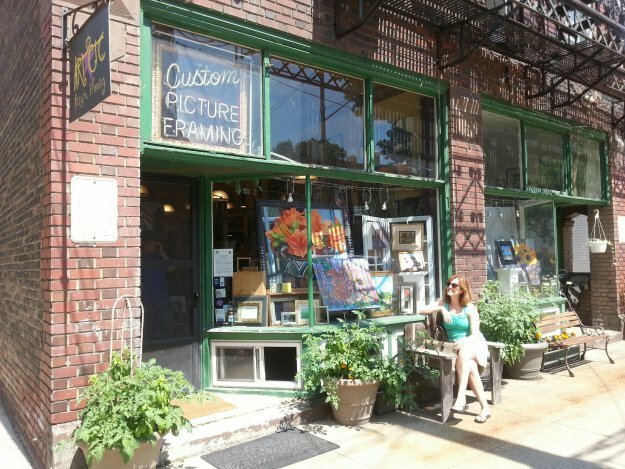 Sarah Ranes sits outside the entrance of Art Etc, located in Little Italy, Cleveland, Ohio. This entry was posted in Busman's Holiday - Road Trip and tagged Art Etc, Cleveland picture framer, Edie Antl, Edith Antl, PPFA member, the framing goddess on 11 July, 2014 by John Ranes II, CPF, GCF.